The Horror Movie BBQ: Saved By The Bell 2015! 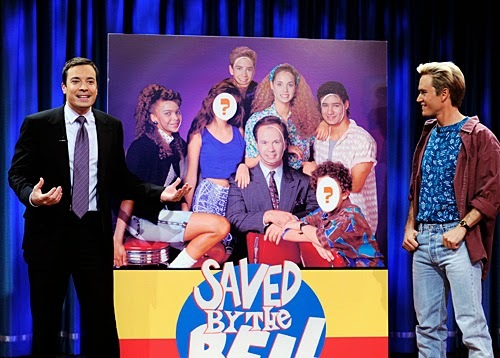 So, if you were watching Jimmy Fallon last night, you no doubt freaked out heavily over the awesome Saved By The Bell reunion that was very lovingly staged by the comedian for his Tonight Show audience. Longtime readers already know of my love for Saved By The Bell from previous posts so I'll bypass any long explanation of my longtime love of the show. But last night was a huge moment for my fellow Bayside Tigers. Why? Well, first off, it was always thought it would never happen. Sure, we've gotten a reunion pictorial from People Magazine and even a campaign from Jimmy on his previous talk show. While a lot of fans, such as myself, had hoped it would happen, it was rather unlikely. For a full reunion, you'd have to have the entire cast of characters and Mr. Belding. Jimmy often had cast members stop by his show and give their stamp of approval by placing their face on a giant cast photo, including Mark Paul Gosselar showing up in character as Zach himself(which was awesome!). So after a while, most fans gave up and it seemed the reunion was dead in the water. And once Jimmy took over the Tonight Show, the hopes for a reunion died. More importantly, Jimmy had bigger and better ideas to tackle. But once it was established Jimmy was going after a much younger audience, fans started to get their hopes back up that we'd see the Bayside crew again. So when Tiffany Amber Thiessen posted a photo of her in her old Bayside Tiger cheerleader outfit next to Mark Paul as Zach, fans went crazy. It was very clear we were going to get something awesome. And we did. A sketch in which Jimmy was a member of Saved By The Bell. Brilliant! The music, the sets, the clothes, everything. If you got lost in it all, you would've sworn it was a new episode. Ok, sure, they all look a little older, but hey, it was a lot of fun to see Mr. Belding, Zach, Kelly, Slater and his hot mama Jessie once again. Now, notable by their absences were Dustin Diamond and Lark Voorhies. Did it matter? Well, to me, no. First off, it's been noted that the cast wants nothing to do with Dustin after his book and his many comments and allegations. Second, without Screech, Lisa would've had no reason for being there. Plus, with all respect to Lark, her physical appearance(as well as mental issues that have been sadly plaguing her lately) would've made her unrecognizable unlike the rest of the cast. Is this the one and only reunion show we need? What about Staci Carosi or Tori or Max? What about Screech's robot? Nah. I don't think we need all that. The sketch, under ten minutes, gave us more than we could ask for. I can't imagine a 30 minute or an hour episode where the entire cast comes back as a whole and gets into shenanigans and having the same charm. What we saw accomplished everything. Whether it was the long reaction from the audience when Zach stepped down the stairs for the first time or the joke about Jessie becoming a stripper, the crowd was surprised big time and very excited to see everyone. As was I. I got very giddy and happy hearing the music and cast along with the NBC bug once again. I'm glad we got it. It was funny. It was magical. It was perfection. It was Saved By The Bell at it's finest. 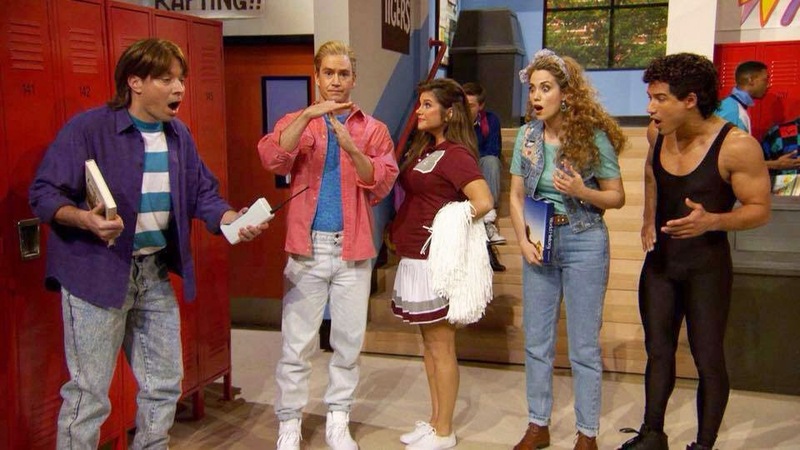 So, thank you Jimmy Fallon, the cast of Saved By The Bell, and NBC for this magical moment. You've made all your fans very happy! Now the question remains. Tonight, Jimmy will be having Will Smith. Earlier this week, Jimmy recreated the opening to Fresh Prince. Could we see something similar? We'll have to tune in to find out! Once you've taken in the unique décor at this place, the hardest part is to decide whether to go upstairs or downstairs at Venues in NYC. With a large open floor plan, you'll find bars on both levels, and someone will always come by to serve you matter where you decide to hang out.